A John Deere 5100M tractor recently marked a significant production milestone as the 1 millionth tractor produced at the company’s Augusta, Georgia factory in the US. Established in 1990, with the first tractor – a 55 Series model – coming off the line in 1991, the factory has specialised in the production of compact utility tractors and now supplies 1, 2, 3, 4 and 5 Series models from 26 to 115hp to a wide variety of customers and international markets. These include farmers, smallholders and large property owners as well as local authorities, landscape contractors, groundsmen and greenkeepers. John Deere’s new 5M Series tractors from Augusta were launched in Europe in 2013. The range consists of four models from 75 to 115hp, powered by Stage IIIB compliant diesel-only engines featuring fuel efficient common rail technology. A wide range of transmission, operator station and pto options are available to tailor these tractors to individual customer needs. For extra versatility, their exclusive mid-frame design enables the machines to be equipped with an optional front hitch and front pto, as well as matching John Deere H260 or H310 front loaders. More recently introduced in 2014, Augusta’s new 4049R and 4066R compact utility tractors feature the award winning John Deere Hitch Assist system as standard. Hitch Assist has recently won awards for innovation at EIMA 2014 in Italy and FIMA 2014 in Spain, following a Silver Medal at Agritechnica 2013 in Germany. The system is designed to make the coupling of implements and trailers to the tractor hitch quicker, easier and safer. 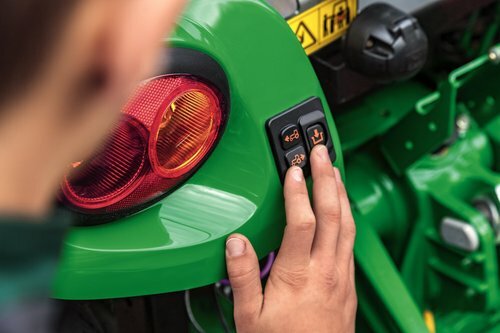 The driver only needs to leave the cab once to use a set of external fender-mounted switches to move the tractor backwards and forwards at a maximum speed of 12mm/second and to lift or lower the hitch from outside the tractor cab. This reduces the set-up time required, particularly for those who need to change implements regularly, as well as the risk of accidents or injuries from repeatedly climbing on and off the tractor.